The photographer’s son, Mark Rogovin, invites PWW readers to see his father’s photographs at , where 1,000 pictures will soon be up for view. This treasure trove includes a vast array of photos of people at work and in their homes, photos from around the U.S. and from many other countries. Among them are rare photos of women miners and steelworkers. “We want to show people the tremendous depth of his contribution,” Mark added. 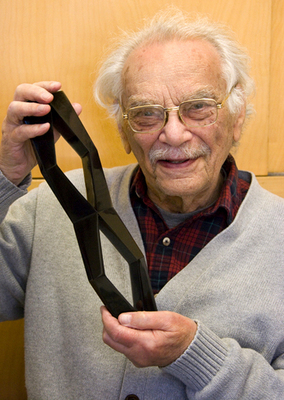 Photo of Milton Rogovin with the Capa award by Gene Witkowski.